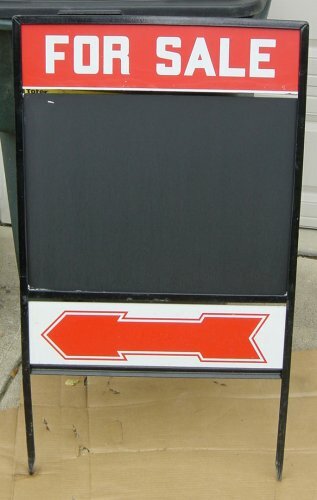 My dad had an extra real estate sign that he let me paint both sides with chalkboard paint. We are going to use it to announce an open house we will be holding for one of his properties. This is the second odd thing I have painted with the chalkboard paint. The other was a tray table that I can doodle on or make notes! Although not a pricey as magnetic paint, I bought the chalkboard paint at Michaels when I had a 50% off coupon. Edited to Reply to Comments: Yes, it is easy to apply. I used a regular paint brush, followed the directions to wait between coats (2) and wait a little long before first use. Cool! I’ve always wanted to try using chalkboard paint. Was it easy to use? From what I’ve seen, it looks like it just goes on like regular paint would. Michaels is awesome, they hand those 50% coupons out like candy.